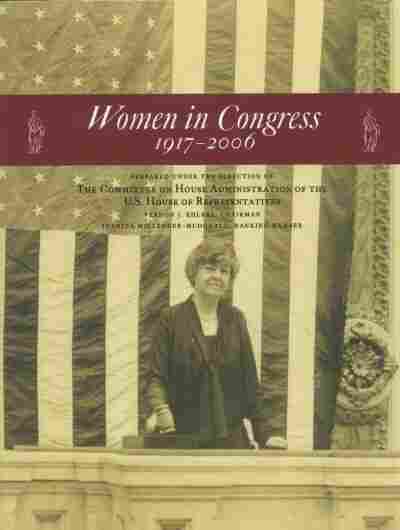 The First Woman In Congress: A Crusader For Peace Jeannette Rankin, the first female member of Congress, was elected to Congress even before all women in the country had the right to vote. She only served two terms — which were decades apart. But it was during those short spans that she was able to take a historic stand. The first woman elected to Congress, Jeannette Rankin, died 38 years ago today. She served two terms, each time voting against U.S. entrance into a world war. It was the day after the Japanese bombed Pearl Harbor, and Americans were afraid. At around noon, people in 81 percent of American households huddled around their radios and heard President Franklin D. Roosevelt appeal to a joint session of Congress to send the U.S. to war with Japan. 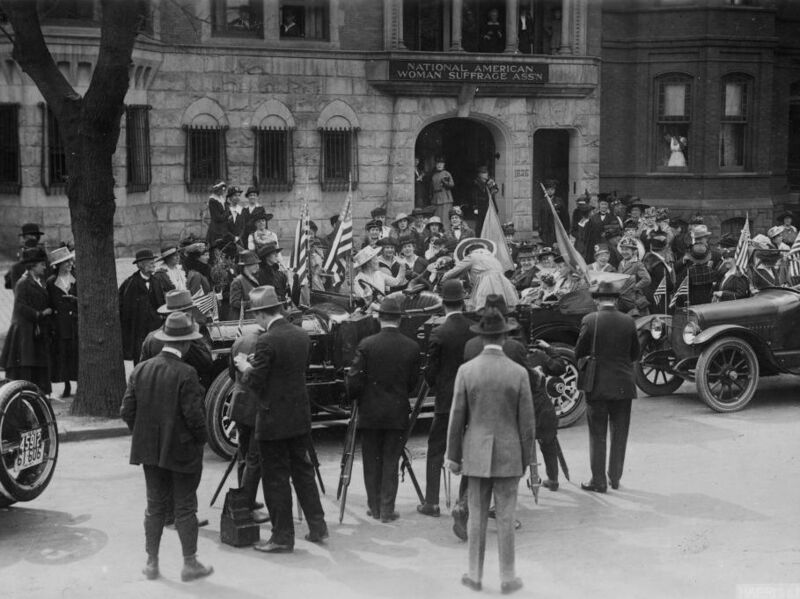 A crowd gathers around the car that will take Jeannette Rankin, the first female member of Congress, to be sworn in in 1917. With the country clearly headed into battle, Montana Rep. Jeannette Rankin was in a difficult position. The progressive Republican, who had campaigned hard on a pacifist platform, had been elected in 1940. She wasn't new to pacifism, and she wasn't afraid to buck public opinion to vote her conscience: Not long after she became the first woman in Congress more than two decades earlier, she had voted against the U.S. entering World War I. She wasn't the only "no" vote in 1917, but some critics used it to question whether women were made of the right mettle to mix it up with the men on Capitol Hill. As The New York Times wrote the day after the vote, "Miss Rankin's vote is regarded, not as that of a pacifist, but rather as one dictated by the inherent abhorrence of women for war." In fact, Rankin's brand of feminism might have led her to take up the issue. 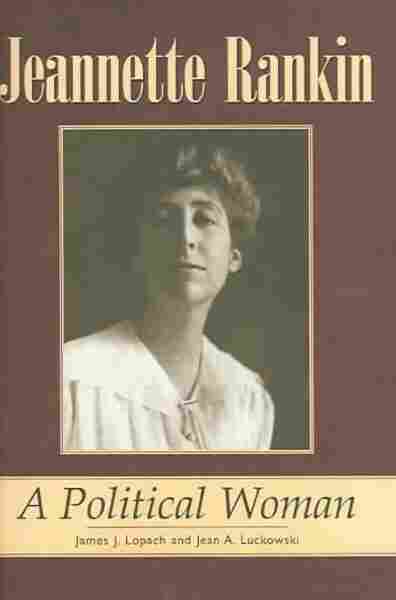 Jim Lopach, political science professor at the University of Montana and co-author of Jeannette Rankin: A Political Woman, said it indeed was Rankin's feminism that motivated her to vote against war that time. "She saw her womanhood as including that idea of pacifism," said Lopach. He said she believed that if women were in power, there might be less violence. Rankin ran for a Senate seat following her first term in the House. After she lost in a tight race, she left politics — until she was elected for a second term in 1940. Jeannette Rankin was the only member of Congress to vote against the U.S. entering World War I and World War II. After Roosevelt finished his speech and left the Capitol, the House and the Senate went into their own sessions. It wasn't long before House leaders got word that the Senate had speedily passed Roosevelt's resolution unanimously, says Matt Wasniewski, historian of the House of Representatives. He says House leaders felt the pressure to do the same. "And if anyone would oppose it, Rankin would," Wasniewski says. Only a day before, Rankin was traveling to Detroit, but she turned around when she heard about the attack and arrived in Washington to vote. The radio audience across the country was able to eavesdrop on the historic session. Mutual Network, in accidental violation of House rules, left its microphones on. Some listeners — including future CBS Evening News anchor Walter Cronkite, who later recalled the scene for NPR — heard the debate and the roll call. For those who missed the moment, a network announcer later gave a step-by-step re-creation. "Miss Jeannette Rankin tried to get recognized here," said the news announcer for the Mutual Network broadcast. "She stood in the aisle and raised her hand. The first time, the speaker angrily brought down his gavel and said, 'Let there be no objection to the unanimous consent.' "
Listeners could hear Rankin, whom the announcer described as wearing a purple dress, try several times to get recognition — to no avail. After a few members of Congress spoke, leaders moved to take the vote. Rankin continued to try to gain recognition, causing frustrated House Speaker Sam Rayburn to boom, "Roll call cannot be interrupted by an emotion ..."
Rep. Everett Dirksen of Illinois, who had been a friend of Rankin's, approached her where she was sitting in the front of the chamber, recalls House reading clerk Irving Swanson in the U.S. House of Representatives' oral history archive. Dirksen put his arm around Rankin and tried to persuade her to vote "present" rather than "no." But she didn't take his advice. Nor the advice of several other lawmakers who pleaded with her to change her mind, according to an article from the Daily Boston Globe. The paper said she simply smiled at them and tugged at her necklace as she waited for her name to be called in the roll. In a clear, steady voice, Rankin voted "No," Wasniewski says. The final vote for the U.S. entering the war was 388-1. Rankin was the only member of Congress who voted against the war. Lopach said Rankin's vote was no surprise. By then, he says, pacifism really was part of her identity. "She really ran to get elected to vote against war," he said. 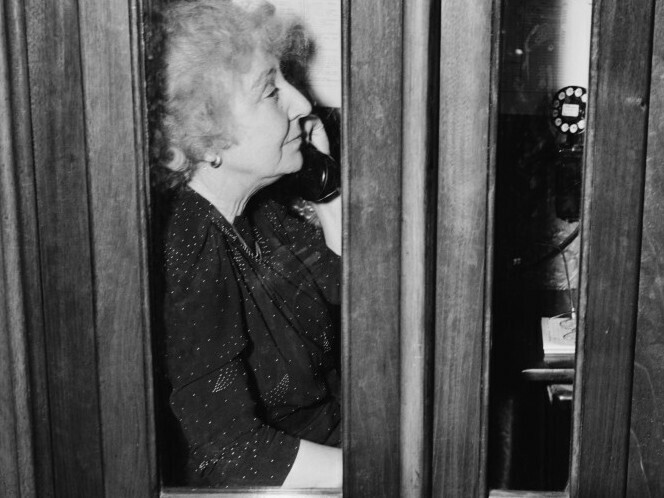 After Rep. Jeannette Rankin voted against the U.S. entering war with Japan, she was mobbed by journalists. Rankin hid in a phone booth and waited for Capitol police to take her back to her office. 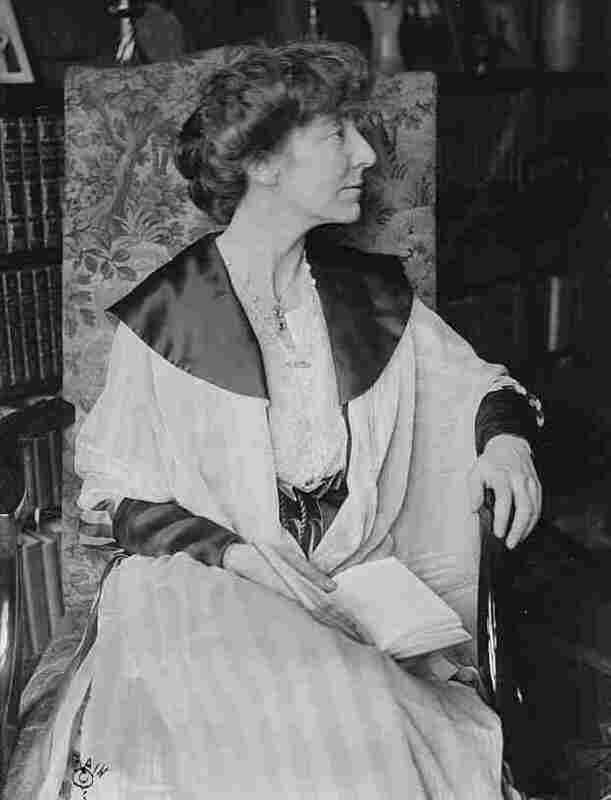 A cascade of boos and hisses from the galleries and fellow members hit Rankin after she voted, according to Jeannette Rankin, First Lady In Congress: A Biography by Hannah Josephson. She was mobbed by journalists on her way out of chambers and had to hide in a phone booth. "As the tempo of the flash bulbs increased," The Washington Post wrote in its coverage of the day, "she picked up the phone in the booth in the House cloakroom, then waited, like a cornered rabbit." Soon after, the paper wrote, Capitol policemen arrived "out of breath from running" and escorted her to her office. "In terms of an immediate [negative] response, I would have a hard time coming up with anything [in history] that matched that moment," Wasniewski says about the vote. Montana, which had been a strong isolationist state, didn't offer her much support. "Montana is 100 percent against you," wired Rankin's brother, according to her biography in the book Women in Congress, 1917–2006. An Associated Press article reported that a Montana Republican national committeeman beseeched Rankin to change her vote to "redeem Montana's honor." She didn't. Days later, when faced with a resolution to declare war on Germany and Italy, Rankin voted "present." 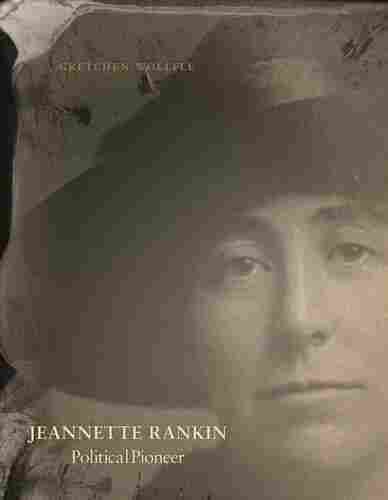 It was pacifism that distinguished Rankin, says Gretchen Woelfle, author of the young adult biography Jeannette Rankin: Political Pioneer. Woelfle says that while Rankin, as the first woman elected to Congress, had been a champion for women's rights, it was her commitment to pacifism that was most significant. 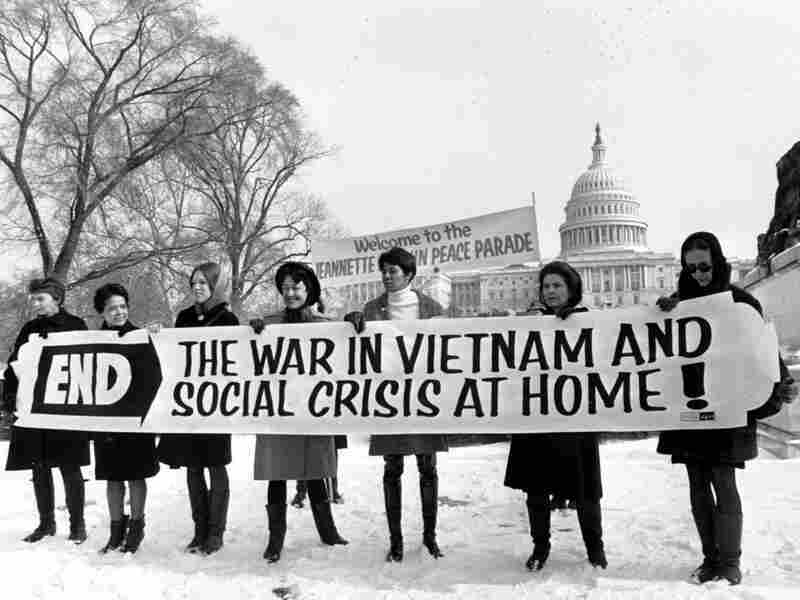 Members of a women's brigade hold a banner protesting the Vietnam War at a march led by former Montana Rep. Jeannette Rankin in 1968. "She was quite alone," Woelfle says. "It was much more radical to be a peace activist during the era that she was — which was her whole life — than to be a suffragette." But Rankin paid for her dissension. She received hate mail from across the country, and, in the House, she became a pariah. Rankin didn't seek re-election after she finished her term. But she stayed politically active — and continued to advocate for peace. At age 87, she led a Vietnam War peace protest at the Capitol, and that same year, she even was considering another run for the Senate. Two years later, Rankin spoke at an anti-war rally and rock concert, Woelfle says. Rankin died in California on May 18, 1973, at 92. "Just a remarkable career," Wasniewski says. He adds, "Whether you agreed with her or not, she stuck to her guns."